When the body of Jamal Cousin, president of the pre-eminent black fraternity at the Florida’s flagship university, is discovered hogtied in the Stygian water swamps of the Suwanee River Valley, the death sets off a firestorm that threatens to rage out of control when a fellow student, Mark Towson, the president of a prominent white fraternity, is accused of the crime. Contending with rising political tensions, racial unrest, and a sensational media, Townson’s defense attorney, Jack Swyteck, fears the worst. The evidence against his client—which includes a threatening text message referencing “strange fruit” on the river—seems overwhelming. Then Jack gets a break that could turn the case. Jamal’s gruesome murder bears disturbing similarities to another lynching that occurred back in the Jim Crow days of 1944. Are the chilling parallels purely coincidental? With a community in chaos and a young man’s life in jeopardy, Jack will use every resource to find out. As he navigates each twist and turn of the search, Jack becomes increasingly convinced that his client may himself be the victim of a criminal plan more sinister than the case presented by the state attorney. Risking his own reputation, this principled man who has devoted his life to the law plunges headfirst into the darkest recesses of the South’s past . . . and its murky present to uncover answers. For Jack, it’s about the truth. Traversing time, from the days of strict segregation to the present, he’ll find it—no matter what the cost—and bring much-needed justice to Suwanee County. This really was a fantastic book. I have been a fan of James Grippando for a long time so I was really eager to get my hands on this newest installment in his long running Jack Swyteck series. This is the fourteenth book in the series but each book in the series works well as a stand alone novel. I expect good things from both this author and this series and that is exactly what I got with this book. I really had a great time reading this wonderful story. This book opens with a bang and I quickly found myself both heartbroken and angry. There are a lot of things in this book that made me angry and broke my heart because the subject matter is just really emotional. The mystery involves the apparent lynching of a young black man at a local university which sparks a lot of racial tension in the community. Jack becomes the lawyer for the young white man that has been accused of the murder. I thought that this was a really interesting perspective into the crime. There really doesn't appear to be a whole lot to tie the young man to the crime besides a racist text the his client denies sending. The case ends up being a whole lot more complicated than anyone realizes. I really liked how we get to see each stage of the legal process in this book. Each stage is represented from initial questioning of the suspect, indictment, and bail hearing. We see how difficult it can be for a lawyer to represent a client that doesn't always share what they should or take the advice given. I felt the fear of the his client, Mark, as he goes to prison and fears for his future. I liked the characters in this book. I think that this series has been focusing less on Jack's personal life in later books. There is still some scenes with Jack and his wife and daughter which I enjoyed. Theo makes an appearance but doesn't play a big role and I have to say that I missed Theo working alongside Jack. Andie, Jack's wife, does get some of her own action in this one to keep things interesting. There were a few characters that were easy to hate such as the prosecutor who is more focused on his re-election than justice. I do highly recommend this series to others. This was a book that really kept me thinking and glued to the pages. It really was a great story with twists and turns that kept me guessing until the very end. I can't wait to read more from this talented author. New York Times bestselling author James Grippando was a trial lawyer for twelve years before the publication of his first novel, The Pardon, in 1994. 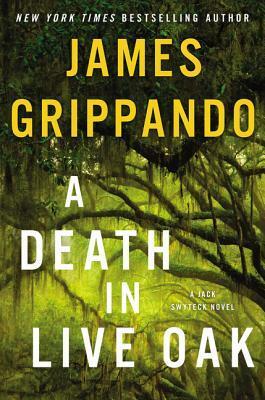 A Death in Live Oak is his twenty-sixth novel. He is a practicing attorney, teaches at the University of Miami Law school, and lives in south Florida. wow it looks good. I haven't tried a book by this author but you're making me curious! Plus, the story looks really good and intriguing! He is a really great author, Melliane! Haven't explored much in the suspense genre since I'm crazy with Mary Higgins Clark, but my! This one sounds really good! The legal parts of this book are very well done. I think you would like this one, Vanessa! I have somehow missed this series. It sounds like something I'd love especially since it gets into legal thriller territory and has challenging, thought-provoking elements. The author is a lawyer so he knows his stuff regarding the legal aspects of the book. I envy you your ability to stick with a series through book #14! I am so terrible about that. Glad you enjoyed it. I have read most of the books in this series. I may have missed one or two but you can jump in anywhere with this series. That's good to know! I have a terrible habit of picking up books mid series and confusing the heck out of myself. I started out with the fifth book and then went back and read the earlier ones. I have definitely jumped around a bit and skipped some of the books. You can definitely jump into the series anywhere without any problems. I think that the emotional part for me was just because it was so realistic. This series started in 1994 and is still going strong! I've never read any of these books, but that's great they can be read as standalones. Thanks for sharing. This does sound like a really well done book - I do enjoy books that can evoke such strong emotions. It was great. The case was a really emotional one. I never knew about this series. I will have to check this one out. Great review. It is a really well done series. I wish more people would read this talented author. Huh I don't know this author or series .Definitely something I think I should check out though. Great review! I really love his writing, Grace. This series is one that I have really enjoyed over the years. I tried hard to figure this one out but couldn't do it. It was a lot of fun to read. I haven't read a legal thriller in a while, this and the series sounds good! Great review. He does a really great job with this series, Kimberly. I think you would enjoy his work.